An institution associated with the Holland Historical Trust, the Holland Museum currently houses a vast collection of local and Dutch artifacts. Previously located at the Kremers’s mansion as the Netherland’s Museum, the Holland Museum moved into its current location on 10th Street in 1992. The Holland Museum currently occupies Holland’s former post office. Prior to the post office, the site was home to the Phoenix Planing Mill, which created specialized wood products from base lumber. The mill was built in 1850 before its destruction in the Great Holland Fire. Although the mill was rebuilt after the fire, hard times followed, and by 1879, the business went bankrupt. The present building was constructed between 1914 and 1915 and was referred to by early contemporaries as the Federal Building. Mayor Nicodemus Bosch and Dr. Beardslee of Western Theological Seminary attended the cornerstone-laying ceremony. The names of Secretary of the Treasury William G. McAdoo and the supervising architect Oscar Wenderoth are engraved on the cornerstone itself. The post office soon moved into its new home from its location at the corner of Eighth Street and Central Avenue. It remained there for several decades before moving on to yet another home. The Holland Museum itself has an interesting history prior to settling in its present location. The origins of the museum’s collections are in Hope College’s collections of books, taxidermy animals, maps, etc. In 1896, a building in honor of Reverend Albertus C. Van Raalte was constructed and housed the museum’s collections. Dedicated in 1903, the museum was located on first, third, and fourth floors of the building. Its store of artifacts continued to expand as Reformed Church missionaries brought back objects from their journeys. The origins of the museum itself come from plans made in January of 1937 for Holland to remember its past. The results of this were Founders Day and the idea of a museum dedicated to the city’s past. The following year, a ballot on establishing a Dutch Architectural style building to house the museum was issued. If the bond issue went through, then the remaining $69,500 would be provided by the Public Works Administration. The bond issue failed, however, and the city looked elsewhere for a home for the museum. 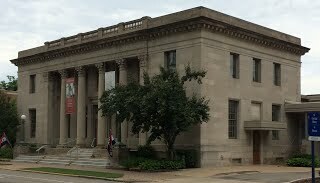 The former Masonic Temple building allowed for a temporary location, but the city declined the bank’s offer to sell it for the museum location itself. Eventually, the museum found a home in the Kremers’s mansion, the former hospital, located at 12th Street and Central Avenue, in 1939. The museum was called the Netherland’s Museum. Local generosity and goodwill from the Dutch government ensured that the museum received a steady stream of donations for its five-decade stay at the Kremer’s Mansion. During her stay in Holland in 1941, Princess Juliana of the Netherlands visited the museum and signed the guest book. In 1985 the Holland Historical Trust formed. The organization became the steward of the city’s history and historical collections. In 1992, the Holland Historical Trust bought the post office building and began remodeling it. The extensive restoration was complete by December of that year, and the current museum opened its doors on December 12, 1992. The most significant development since the move to the post office building has been the creation of the Dutch Galleries in 2007. Located on the second floor of the building, the galleries contain fine examples of Dutch painting from the museum’s permanent collection, donated pieces, and various private collections.